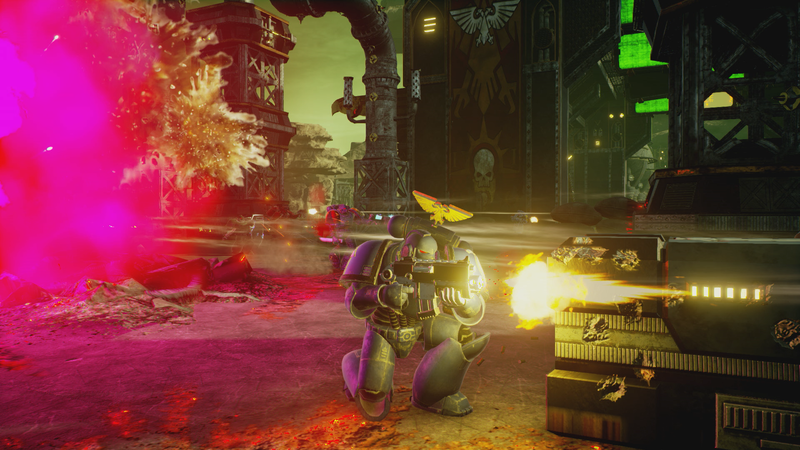 MissyS: Eternal Crusade launched initially more like a lobby shooter, but promises still to be an MMO. What is the developmental roadmap and goals to make the game into that MMO vision? Nathan Richardsson: During our Founder and Early Access period, we did a couple of newsletters or “states of the crusade” where we shared that. It’s a step by step hub-and-spoke approach; the garrison is the hub and the spokes are the maps and modes you fast travel to via the world map. It gives us a lot of freedom to add to the game new types of game modes, “maps”, mix solo, guild, pve and pvp together in new ways without it inherently disturbing the overall game experience, balance and the development progress. With the hub-and-spoke, different activities can affect the factions and territories with lots of fun results such as what extra powers a Warlord of a Faction can bring to the battle during a Campaign. The campaign can then also affect areas. For example with Abaddon doing a certain push, he could put a warp storm, which changes the rules of combat entirely in some areas, safely without directly negatively affecting all aspects of the metagame and larger world. So, first in is Campaigns which are now factional goals and will evolve all the way down to personal goals. Then we’re looking at more work on the metagame, specifically the world map, Warlords and more character options, which will be big in our upcoming expansion with the Terminator Equivalents. In the end, it’s a more flexible, achievable and robust development model, especially post launch, compared to relying on non-existent tech we’d have to create ourselves instead of simply buying. That’s our future vision. The ultimate playground for your Warhammer 40,000 fantasies. MissyS: How will you transition the game into a more open world? Nathan Richardsson: Maps can grow and who knows, maybe someday we can phase from map to map, but it’s currently nowhere in the cards and not on the near-term roadmap. 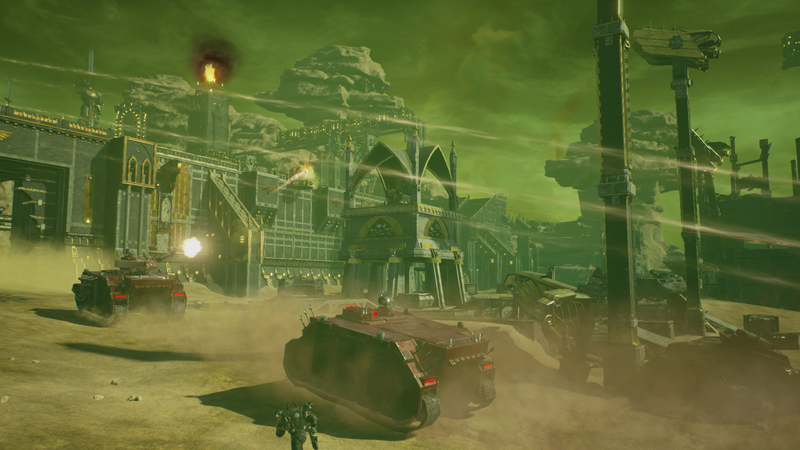 Our intent is that you get that “open world” feel in our maps by making larger more open areas with a focus on moving your squads to a certain area within a troop transport and dynamic encounter as it would be the ultimate location to have multi-faction encounters with Tyranids in the mix. We can have entirely different rulesets in all these areas in the hub-and-spoke model, and how they contribute to the persistent world map and Campaigns gradually over time, by simply adding a new type of area like that. When we’re there with the systems and tech we need, we create an area and connect it to the hub, the Campaigns and the world map. 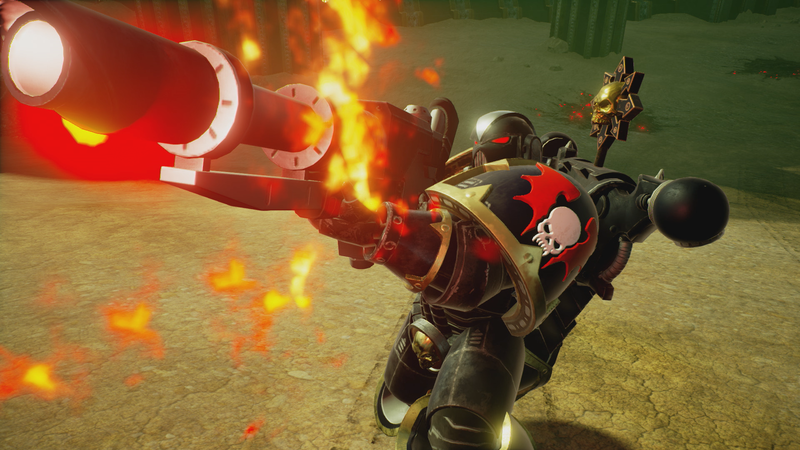 First though, we have a lot of things we wanted to have at launch, so coming in are Campaigns, Warlords, Terminator equivalents and more work on creating a meaningful metagame, while also expanding upon the platform we already have. Mid-term is for older promises we still want to fulfill, like the bikes, more character progression (like Heroes and Elites) and more classes and vehicles. MissyS: Do you plan on implementing voice chat soon? Nathan Richardsson: Absolutely. We’re simply evaluating solutions still that suits us best as we must take into consideration consoles, as well as PC, so we couldn’t easily start just with Steam Voice for example. But of course, we’ll have voice. MissyS: Do you have plans to improve the current guild system? Nathan Richardsson: Yes, quite a lot. Ranging from the core system of communicating and organizing as a guild, to easily setting up scheduled matches, having a garrison for yourself and so on. It’s a core of our future vision. Hub-and-spoke also lets us use any of the current areas, create a special ruleset – tournament – which forces a certain set balance in the teams. Then we’d like to connect all those results into the Campaigns and world map. MissyS: Let’s talk about some of the criticism since the game launched. To start with, many players are claiming the game left early access before it was ready. In retrospect, do you feel you released the game on time? Nathan Richardsson: On time? Yes. Where we wanted it to be? No I don’t think so; we had some difficult choices in the last meters and we decided to work more on the character, wargear, progression and combat at the cost of campaigns and a meaningful world map. Our expansion and content updates are free and the first one coming in a couple of weeks adds Campaigns followed by Warlords. We’re committed long-term and essentially the result was we launched the foundation and the first expansions are laser focused on what we feel are the missing launch features. We had to launch due to a lot of reasons, internally, partners and commitments which all play into determining a launch date. If anyone wants someone to blame, they can start with me and nobody else since my job is to make sure all those ends meet successfully. MissyS: One major issue that has been concerning players is optimization and game performance. Are you looking for ways to improve this? Nathan Richardsson: We’ve been doing that constantly since Early Access. We didn’t during Founder’s Access; it was way too early, but we’ve continued post launch, both on client, server and netcode. This is all with benefits and drawbacks of using a next-gen engine like Unreal Engine 4. One thing that happened was that it turns out UE4 and AMD/ATI don’t like each other, and we had to be integrating the latest versions of UE4 shortly before launch to address those incompatibility issues amongst other things. Other games had even more severe problems than us. One thing doesn’t change though, this is UE4 – it’s fantastic but it isn’t comparable to old engines. You need a recent rig to run it properly. Our recommended spec is almost 3 years old graphics cards right now. MissyS: Another issue that has been discussed is balance, particularly when it comes to melee weapons. How are you looking to make ranged players feel more durable? Nathan Richardsson: We haven’t stopped balancing. We’re updating weekly right now and every single patch includes balance changes, more wargear, changes in functionality to all combat. We’re monitoring tons of data, playing, looking at feedback and doing changes based on that. One thing that’s important to understand about balancing is that you don’t do a ton of changes at once. Doing so runs the risk of polluting data and making everything worse, so testing long-term balance effects anywhere else than on the Live servers for us is never going to work. We only have indicators based on the data and feedback before we can do changes and test them internally in our daily playtests of our daily builds, but it’s never the same as 30k people hammering it over a week. MissyS: What other goals do you plan to deliver on from the list of things promised to founders? Nathan Richardsson: Armor is coming in the short term; the Heroes, Elites, and Bikes are coming in the longer term. It’s our intent and goal to gradually work and expand on what we already have, add what we wanted to have at launch and a lot of what was discussed early during the Founder’s period. The dream still lives that was created a long time ago here. I only joined less than two years ago but I joined because of Warhammer 40,000 and the potential of that dream. So we’re going there and we found a way to achieve most of what we want to do and are confident that we can continue well beyond that. 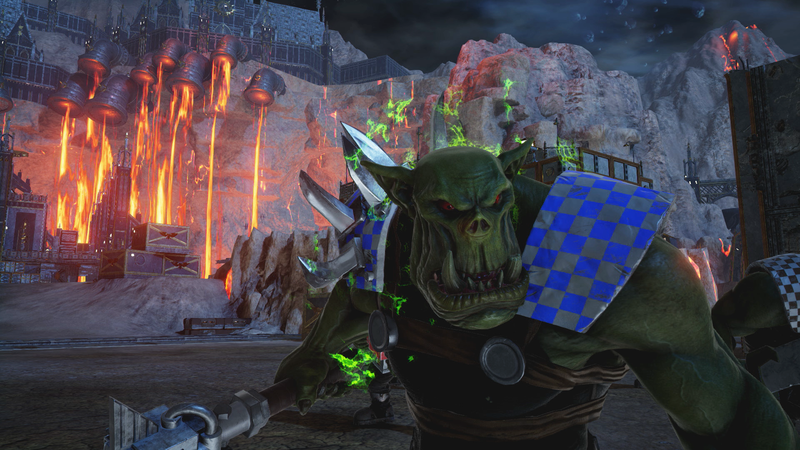 Seeing what we did in those 2 years and with the platform we now have proved to us that quite a lot of amazing experiences are leading up to our fantasy Warhammer 40,000 universe. MissyS: What message would you give to gamers who are still on the fence about getting the game? Nathan Richardsson: If you’re on the fence, you should stay there. We’re showing with our actions that we are still here and expanding with regular patching, our first big content update coming in some weeks, and more slated for December. Jump in when you feel comfortable investing your time to be part of this ride. There is only one entrance fee, which should make you feel more comfortable, because you can always come back to something fresh.